We will soon be adding a really nice simulation of an Approvals Process. In this simulation, documents submitted for approval can go through three levels of approvals, either in series (one then the next), or in parallel (copies go to all three levels at the same time). The main finding of the simulation is that Series outperforms when the reject rate is high during the first two steps. Parallel outperforms when the reject rates are low during the first two steps. Also interesting is the trade-offs between different types of “TIMWOODS” waste. Do you minimize Wait in the Series scenario, or minimize Overproduction and Scrap in the parallel version. 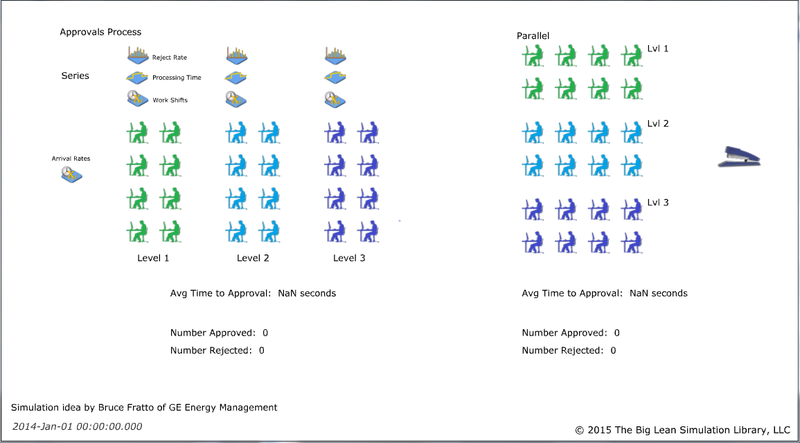 The idea for this simulation came from Bruce Fratto of GE Energy Management. Thanks Bruce! This entry was posted in New Simulation and tagged Approvals, Lean Simulation, TIMWOODS, Waste on May 4, 2015 by Jerry Levasseur.